The coupling of fluorophores with surface plasmons on continuous metallic films or metallic nanoparticles can be exploited for amplification of fluorescence signal in assays for detection of molecular analytes. Plasmonic structures can be designed to enhanced the fluorescnce signal through combined effect of plasmon-enhanced excitation rate at the absorption wavelength of a dye, highly directional angular emission distribution, and improved quatum yield. Particularly, we focus on schemes that are compatible with compact / portable sensor devices and advanced multiplexing of sensing channels. 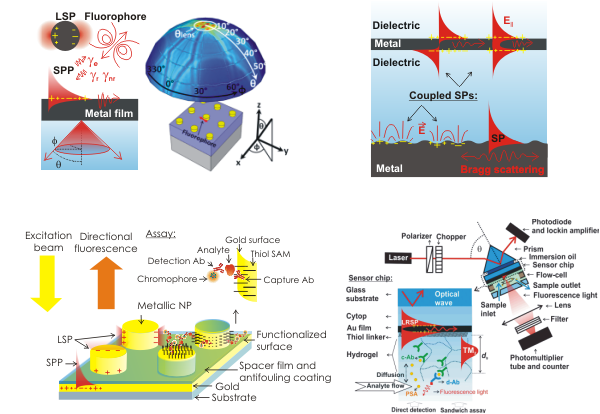 M. Bauch, K. Toma, M. Toma, Q. Zhang, J. Dostalek, Surface plasmon-enhanced fluorescence biosensors: a review, Plasmonics (2014), in press. In colaboration with Jonas group at University of Siegen, we conduct research on implementation of various polymers, particularly hydrogels, to plasmonic biosensors. For instance, these materials can be used in biointerfaces with large binding capacity due to their huge inner surface area, highly open structure and good anti-fouling properties. This research goes towards continuous monitoring based on immunoassays and molecular imprinted polymers (MIPs). Within this framework, hydrogel optical waveguide spectroscopy (HOWS) can be used in which the polymer layer serves simultanouesly as a binding matrix and a waveguide offering direct refractimetric detection with the figure of merit (FOM) as large as 800 RIU-1. Reseach on overcoming diffusion-limited mass transfer of analytes from a sample to the sensor suface is pursued. The research work in biosensor area aims to impact the fields of medical diagnostics and food control. In particular, new systems that can povide rapid, sensitive, and on site analysis of trace about of chemical and biological species are investigated. These include biosensors for detection of small molecules (such as estradiol, aflatoxin M1), medium size biomakers (prostate specific antigen, interleukin IL-6), and larger bacterial pathogens (E. coli O157:H7).